Lula (my favoritely named person) is having a bad day. She witnesses the murder of a barbecue king by some decapitating-happy psychopaths and wants deep-fried chicken with a side of doughnuts but can't find any. Now the killers are looking to put her in a similar headless position. So what's a girl to do? Recruit her good friend Stephanie Plum of course, and with the super-duper help of Grandma Mazur, enter a national barbecue sauce contest to track down her would be axe murderers. But Stephanie has her own set of problems at the moment. Ranger's got a mole in his security operation and is need of her, ah...expertise. And even worse, no proud Jersey girl looks good in black. Anyone who has ever read a Stephanie Plum novel knows "Death in the Burg was like pot roast at six o'clock. An unavoidable and perfectly normal part of the fabric of life. You got born, you ate pot roast, and you died." And then there were some new (spoiler) developments that I found not the least bit Plumish. There's a lot of farting and other forms of bowel discontentment. Good grief! Is this what one of my favorite series has evolved into?? Farts for laughs? And another thing, the flirting is sub-par, I would even say non-existent between Ranger, Morelli, and Stephanie. N-O-T-H-I-N-G happens. 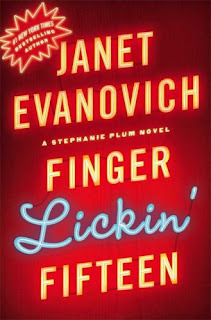 If Evanovich thinks I'm reading these for only the fart jokes then she's got another thing comin' Burg girl! So, overall then, I was disappointed with this one, and probably with where the series is headed in general. Time for Stephanie to move on with her life. Introduce a new love interest, get her married, something. Anything, but this. Until then, I'll stick with books 1-10, by far the best in this tried and true tale of a curly-haired, blue-eyed babe from the Burg. And since the barbecue sauce was a main character of sorts, I was hoping she'd include a recipe at the end (but then I remembered the super rich Janet doesn't cook), so I decided to add my own version here. Feel free to - like in the book: explode it, smash it, crash it, and cover the ceiling with it. It'd probably taste better that way. Heat in oven until bubbling. Eat on toast, with a hot dog, in a bread bowl or all by its little self. hmmm. other than not knowing who Joyce Barnhardt is, your checklist pretty much sums up the status of the Stephanie's personal situations at the end of Book #2. Exactly! It's just more of the same story line, minus any lip action, which is somehow, worse for crying out loud. I want kissing! I want naked! Lula farting really didn't do it for me. If I was a man maybe..
Or maybe not..why did I include a recipe for barbecue beans after all? Jack Daniels in JA Konrath's books is the same way - at least after four books. she's got a hot BF that she wants to marry, but he gets mugged, poisoned, assaulted, kidnapped, shot, spayed, or transmogrified early in each book, and spends the rest of the novel in Intensive Care. i have a feeling after another dozen books, they'll still be trying to tie the knot. Dang, I must have a problem because I totally want to read that one too!! I need a self-help group to cure me of my addiction to books that go-no-where. Love your checklist! It made your review so fun to read! Although, sadly perhaps :( I'm not interested in these books for now. I'll have to try those BBQ beans as I've been looking for a good recipe. The first ones in the series are excellent! Don't let this one taint your desire to read these. They are funny stuff. Hamilcar even liked the first two, and you know how picky he is..and how he likes the relationship stuff in books..right?? One for the Money and Two for the Dough. I'll look forward to your reviews!